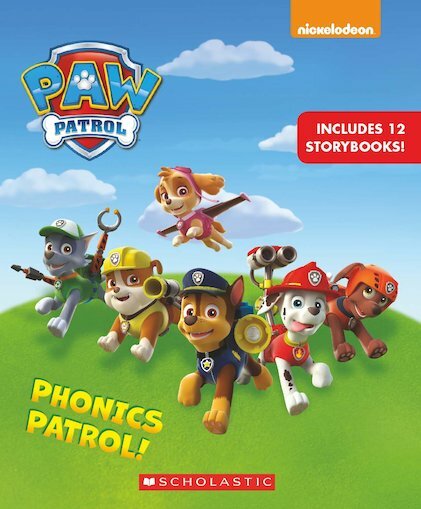 Learn to read with the PAW Patrol! This boxed set includes 12 full-colour storybooks, each focusing on one phonics sound. Designed to help children from Reception to Year 2 practise their reading skills. Perfect for brushing up skills ready for the Year 1 Phonics Screening Test. Phonics sounds covered: short vowel sounds a, e, i, o, u; long vowel sounds a, e, i, o, u.
PAW Patrol: Ready, Set, Read! covers: beginning and ending SH, CH and TH; S blends; R blends; L blends; OO and OI/OY. Bought for my 5 year old, as I wanted to introduce more variety after he started to become bored with the school reading scheme books. My son enjoyed reading this Paw Patrol phonics set, and he quickly became comfortable with the different reading style. The extra incentive to read about his favourite characters on TV was a huge bonus, and he remained happy to persevere through tricky areas.